Activist leaders from the #BlackLivesMatter campaign issued the group's first official national platform on Friday, capping off a week of heightened protests across the nation and signaling a huge shift in the direction of the movement. The group has been making the rounds at 2016 political events, taking the stage at an outdoor rally for Vermont Sen. Bernie Sanders in Seattle most recently to protest what they perceived as a lack of focus on civil rights and criminal justice reform. So, what’s in the new #BlackLivesMatter platform and will their call for policy change help them going forward? According to Sanders’ fellow Democratic candidate Hillary Clinton it should. At a recent meeting with local group leaders, Clinton advised the activists to come up with a national agenda that would help them move toward a solid goal. More than one thousand people are killed by police every year in America. Nearly sixty percent of victims did not have a gun or were involved in activities that should not require police intervention such as harmless "quality of life" behaviors or mental health crises. This year is no different. There have only been nine days this year when the police have not killed somebody. Last month alone, the police killed 125 people. This must stop. We must end police violence so we can live and feel safe in this country. We can live in an America where the police do not kill people. Police in England, Germany, Australia, Japan, and even cities like Newark, NJ, and Richmond, CA, demonstrate that public safety can be ensured without killing civilians. By implementing the right policy changes, we can end police killings and other forms of police violence in the United States. Among some of the group’s 10 suggested changes were independent investigations in any case involving a police officer; demilitarization of local police, including ending the federal government's 1033 Program, which provides military weaponry to local departments; revised and strengthened use of force policies; and mandates requiring all officers to wear a body cameras while on duty. Led by the movement's organizers, Samuel Sinyangwe, Brittany Packnett, Deray McKesson, and Johnetta “Netta” Elzie, the group explained that it would take “deliberate action” at all levels of government in order to see real change, but that that change was possible. “We can live in a world where the police don't kill people by limiting police interventions, improving community interactions, and ensuring accountability,” they wrote. A few of the group’s suggested policy changes have been tried before: in embattled Ferguson, Miss., following the death of 18-year-old black teen Michael Brown last August, police were instructed to begin wearing body cameras while on duty, in order to record all civilian encounters. As was pointed out this past week, however, the majority, if not all, of the officers still were not wearing their department-issued body cameras, a fact which upset some protesters, and even confused a few more conservative voices as well. Policy changes like body cameras and procedural training revisions have been proven to work, at least according to a study published in the Journal of Quantitative Criminology last December. The study, authored by Barak Ariel, a criminologist at the University of Cambridge, indicated that use of police body cameras could be directly correlated with a considerable drop in citizen complaints. When the cameras were off, wrote Ariel, officers were twice as likely to use force against citizens than when the cameras were rolling. The benefits, he indicated, seemed to outweigh any associated costs. Only time will tell whether the policy changes suggested by the #BlackLivesMatter campaign will yield the same results, but for now, it’s a start. “America is finally waking up to this very necessary and critical conversation about race, equity and preserving the life and dignity of all citizens,” said group leader Packett, in an interview with The Guardian this week. 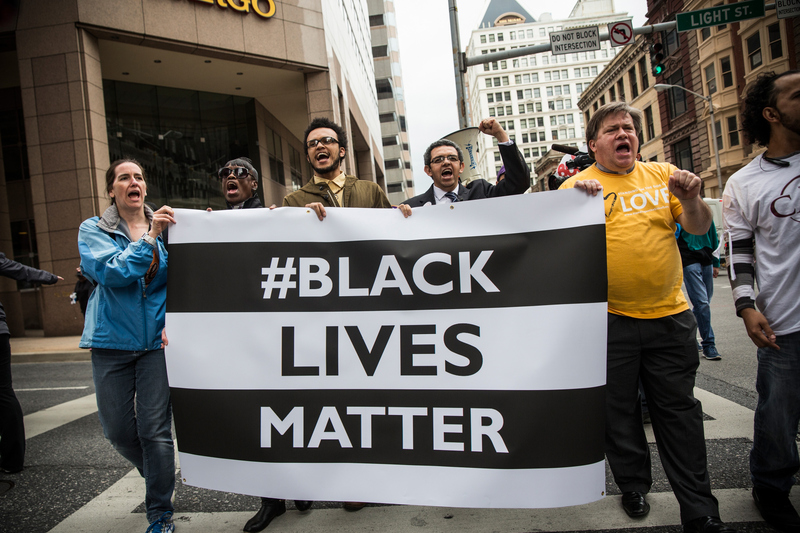 “This is a blueprint for ending police violence,” added co-founder McKesson.